1756 ~ 1776: born in Edo. He became a disciple of the actor Azuma Tôzô II and received the name of Azuma Tomigorô. 11th day of the 4th lunar month of 1776: his master Azuma Tôzô II died. 11th lunar month of 1779: Azuma Tomigorô took the name of Azuma Tôzô III at the Ichimuraza, playing in the drama "Azuma no Mori Sakae Kusunoki", which celebrated also the shûmei of Segawa Otome. 11th lunar month of 1782: Tôzô played the roles of Chidori and the ghost of Sôtokuin in the drama "Ise Heiji Eika Goyomi". 1783: as a choreographer, he took the name of Ikushima Daikichi IV. Fall 1789: Tôzô and Ichikawa Yaozô III went together to Ôsaka. 9th lunar month of 1789: Tôzô played at the Naka no Shibai the roles of Tonami and Tatsuta in the drama "Sugawara Denju Tenarai Kagami". 11th lunar month of 1789: Tôzô performed at the Naka no Shibai in the kaomise drama "Keisei Chigo-ga-Fuchi". 11th lunar month of 1791: Tôzô went to Kyôto and played in the drama "Hakubai Genji Shugi no Hajime", which was produced by Anegawa Kumajirô at the Nishigawa no Shibai. 11th lunar month of 1792: Tôzô went to Ôsaka and played at the Naka no Shibai in the kaomise drama "Chûshin Futabagura". 1st lunar month of 1793: premiere at the Naka no Shibai of the ni-no-kawari drama "Keisei Yanagi Zakura", the first yanagisawa-sôdômono in Kabuki history, written by Tatsuoka Mansaku and Chikamatsu Tokusô; Tôzô played the roles of the nakai Ofuji and the Yodoya beautiful woman [more details]. 5th lunar month of 1793: Tôzô played in the same theater the roles of Fuji-no-Kata and Midaroku's daughter in the drama "Ichi-no-Tani Futaba Gunki". 11th lunar month of 1794: Tôzô moved to the Kado no Shibai and played in the kaomise drama "Tatematsuru Chibako no Tamamono". 1st lunar month of 1795: Tôzô played in the same theater in the new year drama "Ane Imôto Date no Ôkido". 10th lunar month of 1795: Tôzô played in the same theater the role of Ofude in the drama "Hirakana Seisuiki". 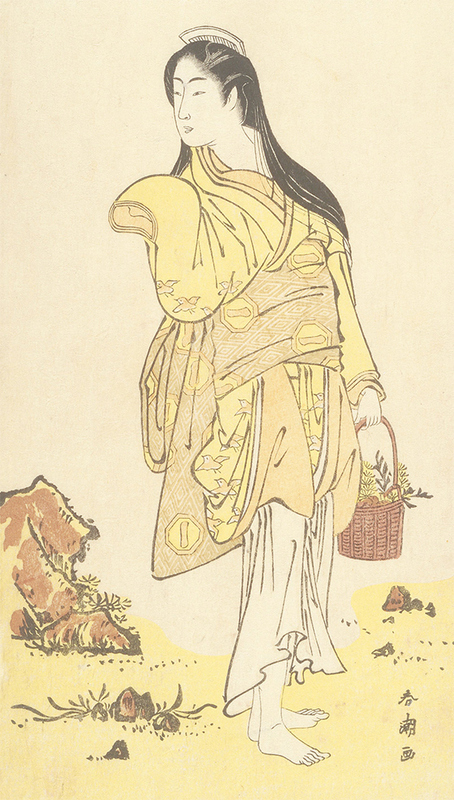 11th lunar month of 1795: Tôzô moved to Kyôto and performed at the Minamigawa no Shibai in the kaomise drama "Hajimete Hiraku Nanshi no Hanabusa". 11th lunar month of 1796: common kaomise program for the Kitagawa no Shibai (Kyôto) and the Kado no Shibai (Ôsaka); Tôzô played the role of Okyô in the drama "Yama Katsura Asahi no Menbako", which was staged in Kyôto from the 5th day and in Ôsaka from the 18th day and celebrated the shûmei of Onoe Koisaburô I. 1st lunar month of 1797: Tôzô played at the Kado no Shibai the role of Oteru in the drama "Futatsu Chôchô Kuruwa Nikki". 3rd lunar month of 1797: Tôzô played in the same theater 2 roles in the drama "Hanawasakura Ako no Shiogama", whose plot and characters belonged to the "Kanadehon Chûshingura" world. After this production, the troupe moved to Kyôto. 11th lunar month of 1797: Tôzô performed at the Minamigawa no Shibai in the kaomise drama "Nanboku Yuki no Miyako", which was produced by Arashi Kumanosuke and celebrated the shûmei of Arashi Raishi I and Arashi Sangorô III. 2nd lunar month of 1798: Tôzô played in the same theater the roles of Haginoi and Osode in the drama "Zôho Jiraiki". 19th day of the 6th lunar month of 1798: Tôzô died in Kyôto. Azuma Tôzô III was a talented wakaonnagata actor, trained in Edo but who started to achieve fame for himself from 1789 in both Ôsaka and Kyôto. He unfortunately died too young. His last hyôbanki rank one really close to jô-jô-kichi (superior - superior - excellent). He was also a good choreographer, working under the name of Ikushima Daikichi IV. As a master of dance, he was the 3rd iemoto of the Azuma-ryû, the Azuma school of dance, which still exists nowadays.